In fig.2 there is a separate connector (COX3 SMB Rx) if you are using a separate transmitter and receiver, in which case the jumper, visible in the upper left of Figure 1 should be positioned towards the interior of PCB. If you are using a RTx, the jumper must be positioned as in Figure 1. The terminal blocks M1 and M2 are provided for power, one for the entrance and the other, for supply other boards. In this version I omitted C26 Capacitor , to extentd the band until 70MHz (reduced power) and to increase the stability. 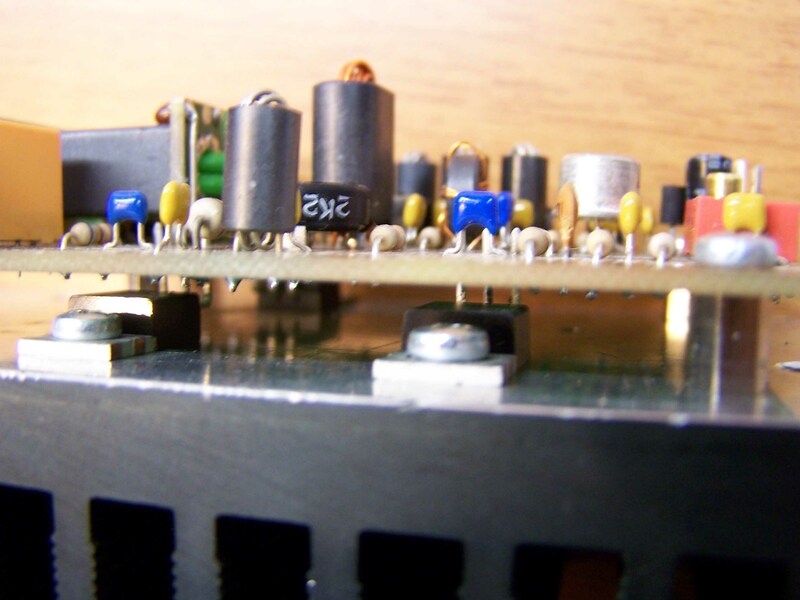 Be careful to properly solder the beginning and end of the windings of T2 and T1. 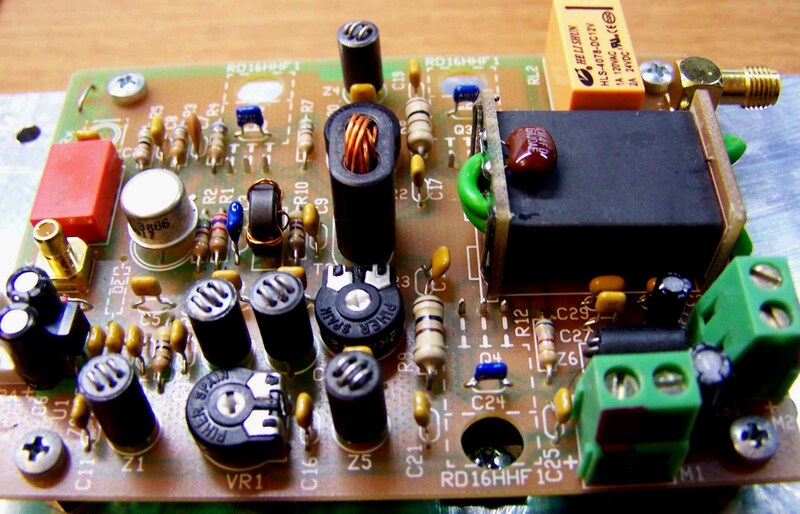 The MOSFET Q2 can be replaced with a RD06HHF1, which is cheaper and performance remain approximately the same. The diode D2 is to be mounted under the PCB and must touch the heatsink with some thermal paste. When you transmit, the center pin, of connector J1 must get a +12 V. This will polarize the MOSFET and energize the changeover relay IN / OUT RL1 and RL2. When receiving, the voltage must go to 0V, so that the relays are released and the MOSFETS do not heat up unnecessarily. The MOSFET Q2, Q3, Q4 are TO220, with the source connected to the case, so the insulating mica plate is not required, but the thermal paste is always needed! After checking that everything is correctly welded and that there are no jumpers of tin between the tracks and between tracks and ground. Turn the trimmer VR1, VR2, VR3, anti-clockwise (CCW). 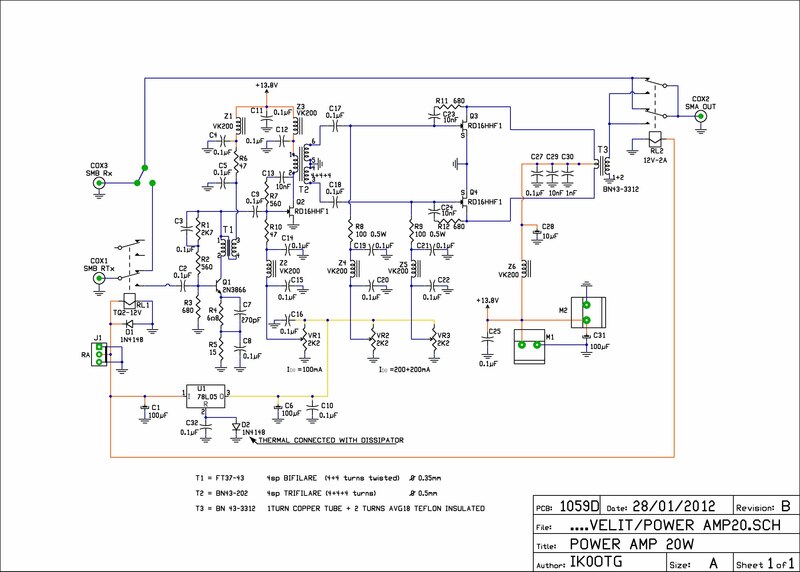 Connect input and output of the amplifier to a dummy load of 50 Ω, ¼ W input and > 20W output. Connect voltage to J1 (12V on the central pin). The current on the M1, it should not be changed. Turn trimmer VR1 slowly clockwise until on ammeter will read a value equal to the first value increased by approximately 100mA (for example, if the first was 65mA, now you have read 165 mA). Slowly turn the trimmer VR2 clockwise until on ammeter will read a value equal to the previous value increased by approximately 200mA (for example, if the previous was 165mA, now you have read 365 mA). Slowly turn the VR3 clockwise until on ammeter will read a value equal to the previous value increased by about 200mA ( for example if the previous was 365mA now you have read 565 mA). With the touch of embroidery or nail scissors , cut the short end for a depth of about 0.1"
Place on the two ends, the two small PCB, with the copper side outside. Solder to the PCB both ends of the tubes. 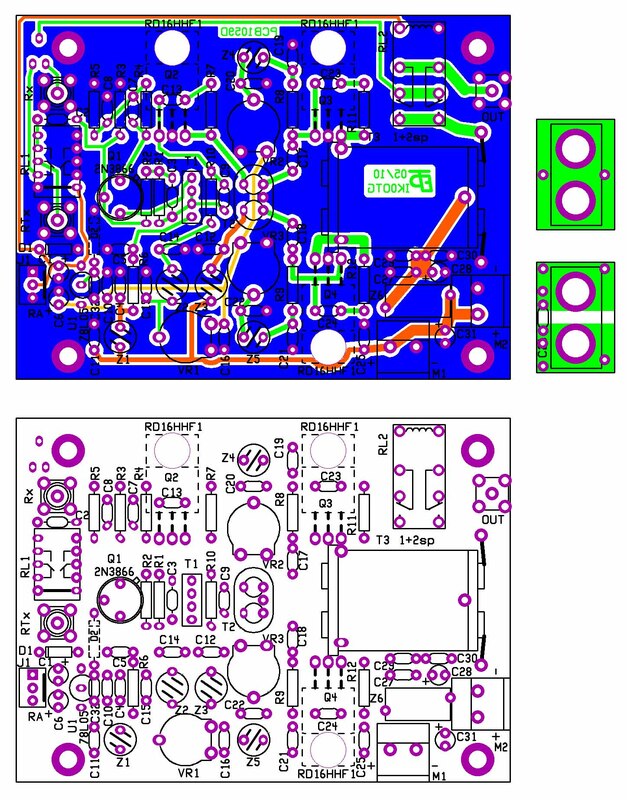 In the Downloads section of this site, you have the schematic and the image of the PCB. For those who wish, are available the three PCB with silkscreen, solder resist and tin.